This is so easy to make and will take breakfast to a whole new level, giving it some zing. We had this on English muffins, then on peanut butter sandwiches for lunch and drizzled over ice cream for dessert. Then we went to the vineyard and worked it all off. What a day. You’ll want to use very ripe bananas, as they will be sweeter. Remember that old saying, “Bananas like the climate of the very, very tropical equator, so you should never put bananas, in the refrigerator.” WRONG!! Putting bananas in the refrigerator will cause their skins to turn dark brown in 24 hours, since the cold damages tissues in the peel, and these tissues then release browning enzymes. But the dark skin won’t affect the texture or flavor of the flesh, which in fact will ripen more slowly because of the enzymes that convert starch into sugar work more slowly in the cold. So, if you have bananas that are already as ripe as you want them to be, go ahead and refrigerate them. Anyway, you will love this jam, it’s excellent and a great combination of flavors. 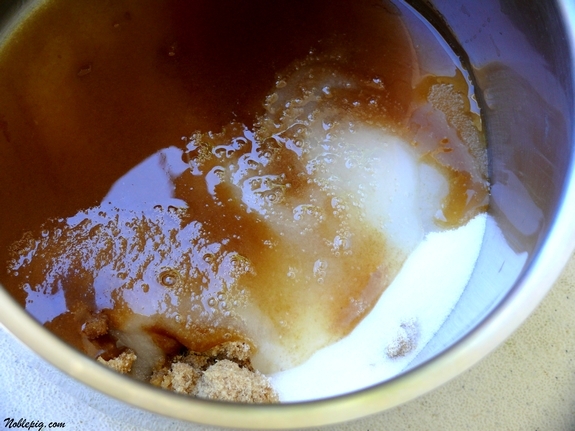 Combine brown sugar, granulated sugar and fresh lime juice in a saucepan; bring to a boil. Add 3 medium peeled and sliced overripe bananas. Reduce heat to medium-low; cook for 45 minutes or until slightly thick, mashing bananas occasionally with the back of a spoon. 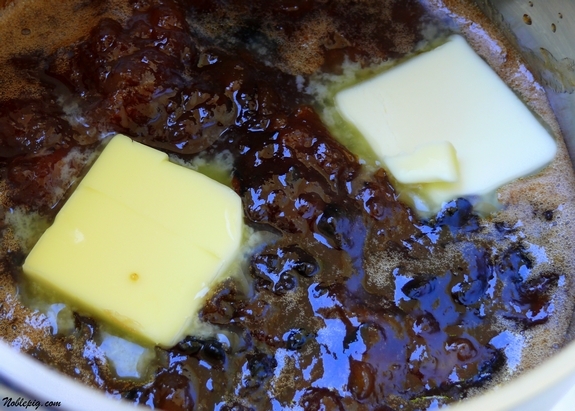 Stir in butter. The mixture will thicken as it cools. I think it would have been incredible with cream cheese on the English muffins as well. I love the combination of bananas and lime! I am sooooo making this tomorrow! Yum! And knowing I love all things banana! Sounds like an intriguing recipe! Do you think it only lasts a short time in the fridge or do you think the lime preserves it a bit? And I got a chuckle that you’ve written that “the jam will cool as it thickens”–thanks for the little typo laugh as I head to bed. Makes me feel good to know I’m not the only one. Brown sugar, granulated sugar, butter? Maybe I need to rethink Cooking Light. This is so interesting I will probably try it on my day off. What an absolutely intriguing combination Cathy… who would have thought up such a jam! I know now where my ripe bananas are headed next time! 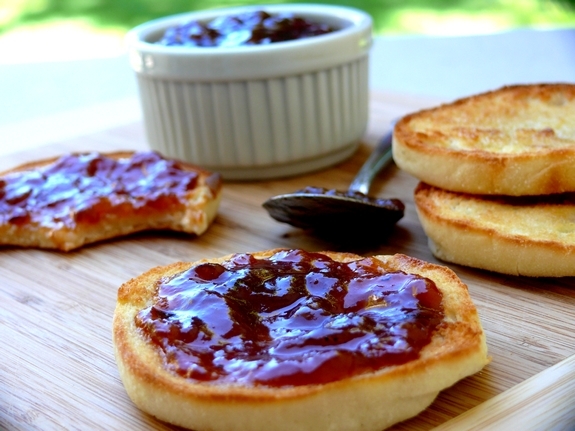 Cream cheese on English muffins with this… mmmm!! This is simply fantastic, i already love it and i am going to make it very soon maybe tomorrow or when bananas will be ripe enough. Thank you, i just needed something like this! Ciao, have a wonderful day! Looks delicious and very simple to make. I think I will try this one. We both love bananas and my hubby especially loves sweets for breakfast! Thanks! I don’t even usually like jam, but I love the ingredients in this one. I’m definitely making it, Cathy–thank you! Do you have a “print” button for your recipes that I’m missing? You often have recipes that I’d like to print in a prepared format, would make it much easier. What an interesting tid-bit about refrigerating bananas! I usually don’t have a problem with them getting too ripe, but I’m glad to know this. This is a really unique combination of ingredients. Certainly one I never would have though of. I’m really intrigued now. Did I miss an ingredient? What gives it the red color?? I also would like to have printed many of your recipes for my files and to have on hand while I’m baking. That is a very interesting combo and a totally new one for me. You do make it lookmost tempting! The print icon is located next to the time and date the article was posted. You must be viewing a page that has all the comments listed. It sits right above the comments section in every article. You didn’t miss a thing, this is just the color it becomes once cooked. Nice combination. I could even see that some coconut would be good in these. Then serveit with morning glory muffins! Your jam looks very delicious. Actually all your recipes look really tasty and I can’t wait to try them. I am also from Northern California and have family in McMinnville. before last night I would’ve thought this was weird…but then I made some banana lime bread and was amazed by the combo! This looks fantastic! I’ll have to make some since I’m out of my store-bought jam, but still have a jar of peanut butter. Thanks! I’ve never had anything like this before – I am intrigued! Love bananas and this sounds really interesting. I’m gonna have to give it a try! This is so good! I just had it on my whole wheat english muffin for breakfast. It’s great, paired with coffee. I will definitely be making this again!!! It makes a good bit too. just made this and it is delicious! it does sound great on english muffins but i am thinking it would be even better on vanilla ice cream! This jam is very good, would like to know if it could be processed in water bath? Hmm, I’ve never done it so I’m not really sure. I wish I knew, never tried it. Just made this jam and it was very easy and quick! Delicious! However mine is not this red color but light brown. I don’t think my bananas were ripe enough but is still very good. 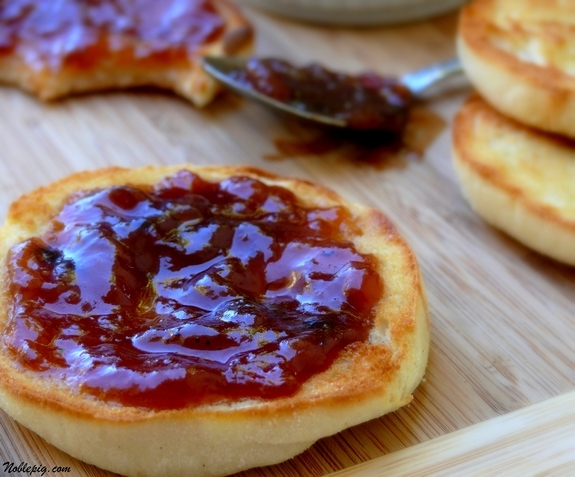 Do you know if this jam can be “canned” using hot, sterilized jars? Or does it need to be refrigerated to prevent spoilage?